Going into this project, a useful skill that I had was definitely being able to research. Specifically for my topic, research was incredibly important, as I obviously couldn’t travel to Mars in order to collect data. Collecting data on how bacteria survive at certain temperatures, pressures, and levels of radiation was definitely difficult, but my partner and I were able to gather enough data to write a paper about it. The process of making the paper was most important during this project, as I think it was the most well made aspect of it. It helped to explain our situation regarding the project. In making the paper, my role was mostly planning it, with a bit of gathering research. Alternatively, my partner helping with research helped complete this project with a beautiful result. As far as personal differences and communication errors, they were fairly limited. The goal was clear to both of us, and I think we had to redirect each other a few times, but overall, I’d call the partner placement a success. The hardest part was just getting the research done. Articles conflicted quite a bit, and most of the data was obscure anyways. I assumed that I would work fairly well with my partner, and that was correct, luckily. The research, although still tough, was far easier than I had imagined. There was a surprising amount of data concerning what we needed, and was easily cross-referenced to produce usable, understandable, explainable data. I learned quite a lot about the subject researched by doing this project. Specifically, just how hardy bacterial spores can be, as well as some of the logistics of the Curiosity mission and Mars’ conditions. Survivable conditions for bacteria (not their spores) was also something that I skimmed over. It surprised me that they were as tight as they were, and their range of survival dipped into Mars-like conditions only rarely. Sadly, I didn’t do particularly well on my poster, at least in my opinion. While it was the right format, and I liked the color scheme, it apparently had a typo, and wasn’t printed. Aside from that, I wasn’t particularly happy with the information presented. It was less about data seemingly, and more about what our course of action should be. Unfortunately, it was more comparative than descriptive. I don’t honestly think this project will have a huge impact on my future, but it’s definitely improved on past skills. I think now I’ll be able to see what works and what doesn’t with infographics a little better. Although I already have some experience with graphic design, this is another point of practice for me. I wish I would have known exactly how much time I would’ve had when doing this project, as I got a somewhat late start whilst working on it. Because of this, I didn’t have a ton of room/time for improvement. 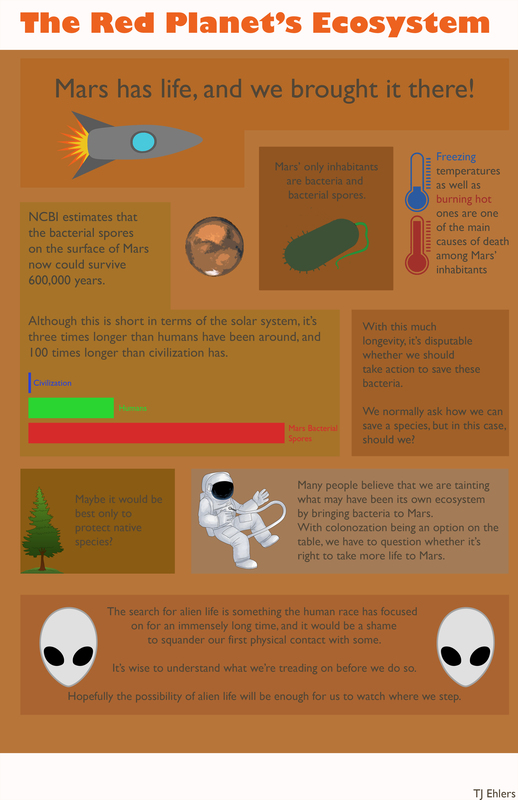 I definitely could have done a lot better if I revised my infographic more carefully. My learning style coincided with this a bit. I have to say that this project was pretty free-form. This was nice, in the sense of having freedom, but just doing research doesn’t always help one retain information. A lecture wouldn’t have been perfect either, but a good middle ground would have helped secure my learning’s security.